Many people believe that certain numbers are drawn more frequntly than others, and that others are selected less often. These are often referred to as: Hot and Cold numbers. In order to help players identify these, many lotteries provide Frequency Tables. However, when trying to interpret this information, players are faced with the several problems and questions. First, does this data indicate that these numbers perform better or worse over the long run? Or, is this simply a function of short term trends? Second, the format of certain games has changed over time. Balls are added and deleted. How can we normalize this information to account for the fact that certain balls have been present longer that others? Third, is this statistical data meaningful? To help answer these questions, we have prepared this analysis which contains four panels. Window LA-1 in the lower left displays a tabular analysis of the most common white and Star lottery balls. The total occurances of each ball is shown for: 3 Month, 6 Month, 1 Year, 2 Year, and All Time terms. The cells are color coded to illustrate numbers that are: Cold (Blue), Cool (Light Blue), Warm (Light Red), and Hot (Red). The non-shaded numbers are neutral. Hotness and Coldness is assigned utilizing a weighted statistical analysis which involves first determining the expected number of occurances, and then calculating the actual observed deviations. This data is shown in Window LA-2. The graph displayed in Window LA-3 shows a normal probability distribution. This is an important concept of randomness because we know that there will be an expected amount of noise (or deviation) whenever such events are measured. Lastly, Window LA-4 puts it all together by summarizing how often the lottery jackpots would be won if a player limits his playing numbers to certain subsets: Hot, Cold, Hot + Cold, Neutral, and Neutral + Hot. These tables only show the highest prizes that would be won, not the sum of all the prizes. Click on the column heading to sort. To return to the default view, click on the Ball Column header. 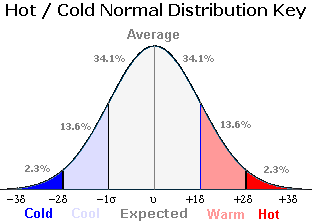 A Normal Probability Distribution is utilized to assign the Hotness and Coldness of each ball. Absolute numeric ranges are determined by adding and subtracting the standard deviation to the average or expected occurances (shown in above Window). Comparing a balls actual occurance to each of the ranges determines whether a ball is Cold, Cool, Neutral, Warm, or Hot. - Hot includes all Hot and Warm Balls. - Cold includes all Cold and Cool Balls. - Neut+Hot includes all Neutral, Warm, and Hot Balls. The above summarizes the largest winnings in each category. For Hot Only, there are 0 white ball combinations. For Cold Only, there are 252 white ball combinations. For Hot+Cold, there are 2,002 white ball combinations. For Neutral, there are 501,942 white ball combinations. For Neutral+Hot, there are 850,668 white ball combinations. Upon completion of Hotness and Coldness identification, balls are simply grouped into 3 categories: Hot, Neutral, and Cold. This is performed by examining the results displayed in Window LA-1. Any ball that is either Warm or Hot during at least two time periods is determined to be Hot. Any ball that is either Cool or Cold during at least two time periods is determined to be Cold. Balls that that have been both Cool or Cold, and, Warm or Hot, are classified as Neutral. Originally, we believed that the concept of Hot and Cold balls was simply bunk, and could be explained simply as random noise. However, after conducting this study, we believe that such identification can be valuable information to the lottery player. The most important facts we learned is that playing a mix of Neutral and Hot numbers could benefit those hoping to win the jackpots. Playing all Hot or all Cold numbers rarely generates a win. But, combining Hot with Neutral may lead to profitable returns.